One of the biggest challenges in public health right now isn’t about medicine. It’s about messaging. As the recent measles outbreak in Clark County has shown, a disease being preventable doesn’t mean people will do what they can to prevent it. A disease once thought eradicated can come roaring back if not enough people are vaccinated against it. Public-health officials and doctors face myriad obstacles when trying to persuade patients to get vaccinated. The trouble can range from falsehoods spread on social media, to lax laws, to tailoring messages for a wide range of audiences. Dr. Anisa Ibrahim says health-care professionals need to constantly highlight the importance of vaccinations regardless of whether an outbreak is going on. “We should always be running an education campaign,” said Ibrahim, who is a clinical assistant professor of pediatrics with UW Medicine and a primary-care provider in Harborview Medical Center’s Pediatrics Clinic. Ibrahim is also the president of the Somali Health Board (SHB), a nonprofit consisting of Somali health-care workers and volunteers aiming to address health disparities faced by immigrants and refugees in King County. In that role, she regularly deals with families needing guidance with vaccinations. She says she is direct with her patients, educating them about vaccinations and listening to their concerns. “I feel very strongly that any conversation about vaccinations should be very educational for the family,” she said. Measles is an extremely contagious disease that was declared eliminated in the United States in 2000 but has resurfaced recently in more than a dozen states, including Washington, Minnesota, New York and California. Measles has also been cropping up around the globe: 98 countries reported more measles cases in 2018 than in 2017, according to UNICEF. Leading the increase by a wide margin is Ukraine, with 30,338 more cases of measles last year than the previous year. The second-largest jump happened in the Philippines, where 13,192 more cases were reported from one year to the next. For communities to be protected from measles, at least 95 percent of the population needs to be immunized. This threshold is called herd immunity. 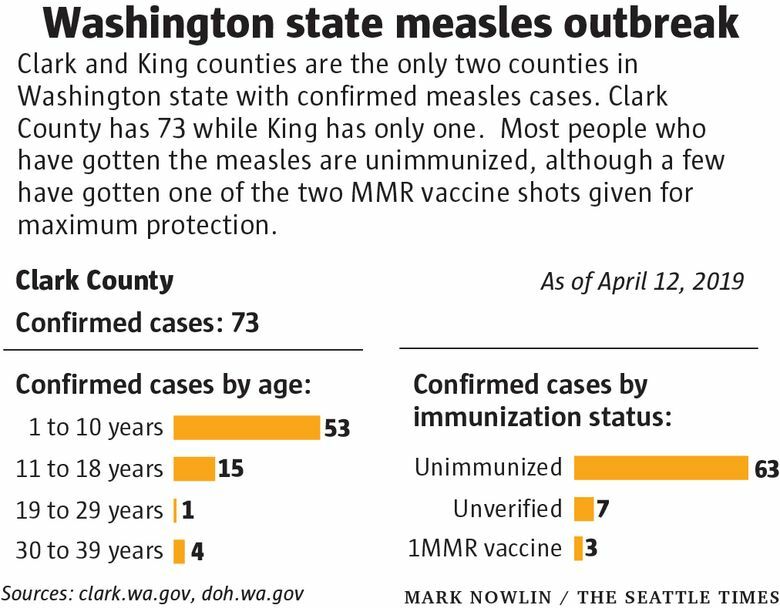 In Clark County, only 85 percent of kindergartners have been immunized with the measles, mumps and rubella (MMR) vaccine, according to the state Department of Health. The county has had 73 confirmed cases. In trying to get a population back up to herd immunity — or to prevent a population from falling below that threshold in the first place — doctors face a relatively new phenomenon: convincing patients their medical advice is more trustworthy than what a friend or family member posted on social media. The debunked theory that the MMR vaccine causes autism has been trumpeted on platforms such as YouTube and Facebook, as well as through professional-looking websites and pamphlets, and by celebrities such as Jenny McCarthy. But Brendan Nyhan, a professor of public policy at the University of Michigan who has studied the impacts of social media on issues dealing with politics and vaccinations, says social media isn’t solely to blame for people not being vaccinated. He said what appears to have the most positive influence on rising vaccination rates are tight vaccine-exemption laws. Washington is one of 17 states that allow some type of philosophical or personal exemption from the MMR vaccine. Lawmakers in Olympia are trying, not for the first time, to change that. The state House passed a bill eliminating philosophical and personal exemptions, and a similar measure is moving through the state Senate. In and around New York City, where 285 people have come down with measles since the fall, elected officials and public-health agencies are taking a tougher stance. As measles ravages the ultra-Orthodox Jewish community in Brooklyn, the city has declared a public-health emergency and is requiring people to get vaccinated. Rockland County, just north of New York City, has seen 167 cases of measles. In response, the county barred unvaccinated children from public places. A state judge put that order on hold. As legal debates continue, much of the work to control a measles outbreak falls to local public-health agencies. Clark County Public Health has a staff of 110. At various times during the outbreak, 89 of those employees were involved with the county’s response. Since March 18, about six people in the department’s communicable-disease program have devoted part of their time to the situation. Health-care workers first try to understand why a person and or their family isn’t immunized and explain why they should be protected against measles, said Marissa Armstrong, a communications specialist with Clark County Public Health. It’s important to remember that parents are trying to do what is best for their children, Armstrong said. Public-health workers try to focus on reaching parents who are considered hesitant about vaccinations but receptive to information. That’s where they have more success, said Dr. Jeffrey Duchin, health officer at Public Health – Seattle & King County. Parents who are outright resistant, he said, are a small group that gets outsized attention. “Those people that are open to getting information is where we should focus,” Duchin said. Further, different groups of people respond to different types of messaging, he said. In fact, some tactics can backfire. A study published in the journal Pediatrics found that parents with the least favorable views toward vaccines were even less likely to vaccinate their children after receiving information refuting claims that vaccines are linked to autism. Public-health officials need to take into account the diverse audiences they are trying to reach and engage with people from distinct communities, Nyhan, the University of Michigan professor, said. 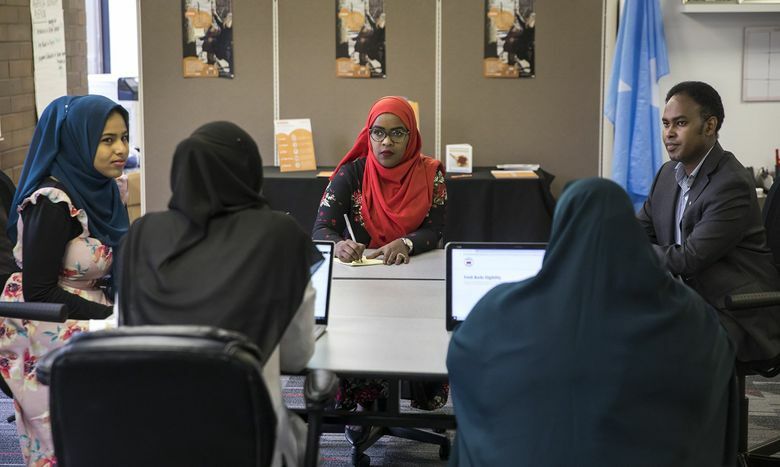 The impact of a 2017 outbreak of measles in Minnesota largely fell on the Somali community there. Seventy-nine people, mostly unvaccinated Somali children, were infected before the outbreak was contained. 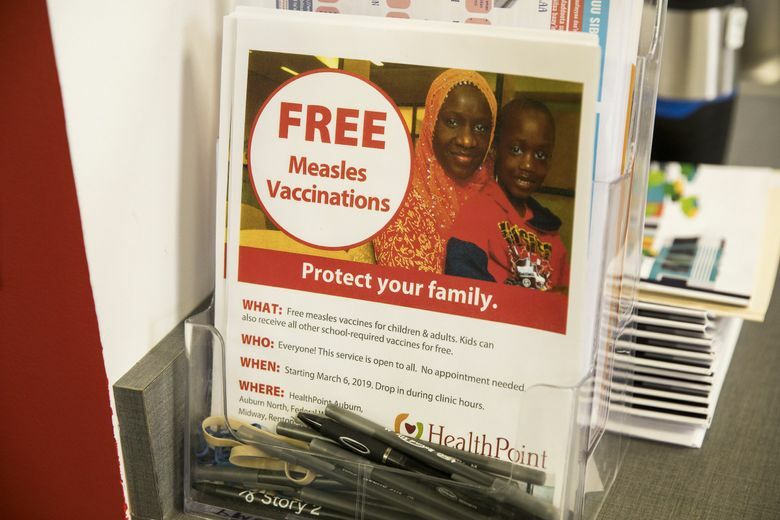 Somalis in the Minneapolis area had been targeted by anti-vaccination groups. The effect of the misinformation was compounded by the barriers immigrant communities face when trying to navigate a health-care system that can be challenging for newcomers. King County’s Somali community has avoided those issues because Public Health – Seattle & King County works closely with the Somali Health Board to promote vaccinations to Somali immigrants and refugees. 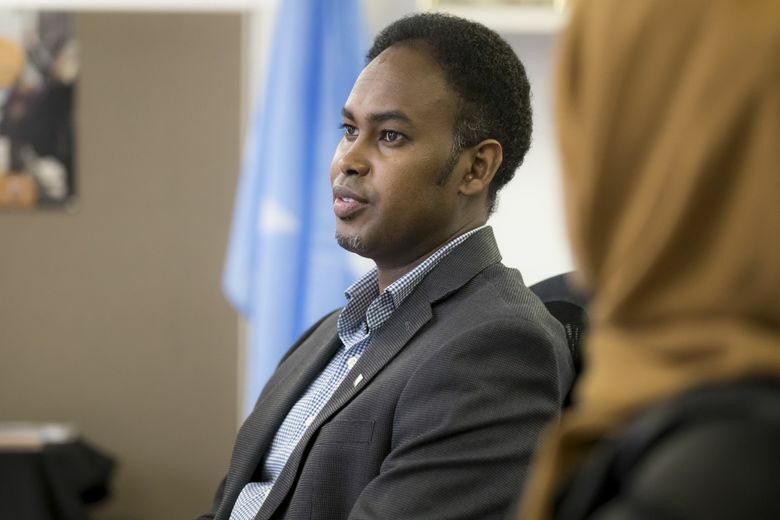 Hesitancy in the Somali community is easily corrected through education, especially when delivered by Somali physicians and health-care workers, said Ahmed Ali, a pharmacist and a founding member of the SHB. 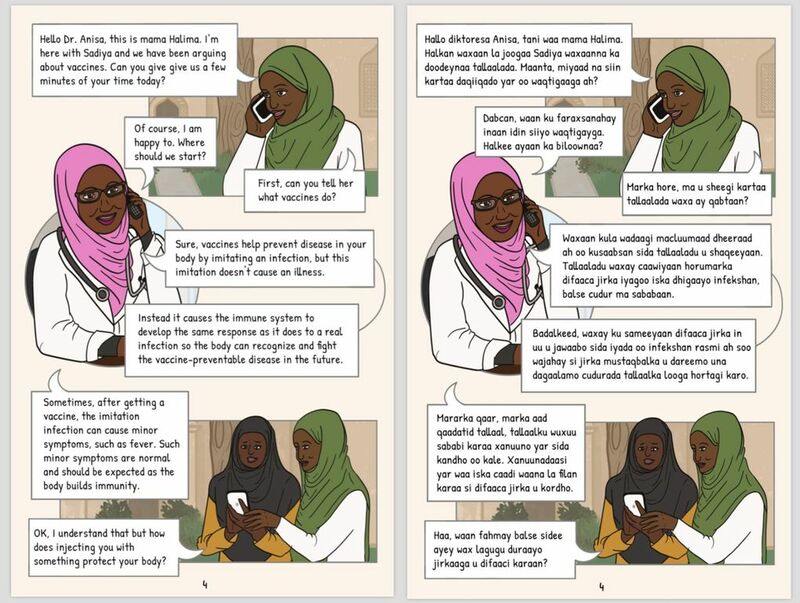 The SHB reached Somalis in King County by having local Somali media feature comic strips that depict a family’s decision to vaccinate, doing outreach on Facebook and posting pictures to social media of prominent Somalis being vaccinated. Members of the SHB will even have dinner with families and bring an imam along who, with “great strength,” explains the importance of vaccinations, Ali said. To connect with parents who might be hesitant, Ibrahim advises doctors to listen to patients and not try to push a decision on them.